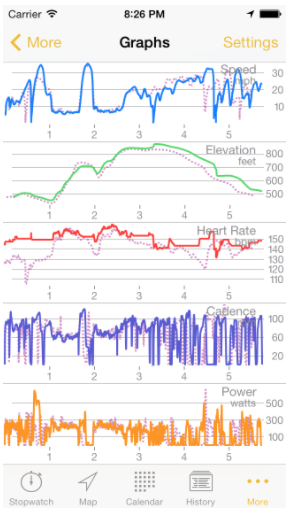 Being a geek, I have been collecting data on my rides for the past 5 years. I’ve gone through several approaches, and certainly don’t have a vast knowledge of all that’s out there, but I’ll tell you what works for me these days. When I moved back to Seattle and started bike commuting again I discovered I could use my new phone (iPhone 3gs) with an app called Trail Guru written by Tim Park. It quickly became my favorite app, although I tried quite a few. Having a GPS built into the phone was one of the “killer apps” for the burgeoning smart phone market, and this was something I used twice daily. Lo and behold, sometime in 2011, Trail Guru stopped working, and there was no word from Tim. Eventually, the app fell out of the App Store, and I had to move on. Unfortunately, the web site went offline and so did my data. This soured me on the smartphone idea for a while. I picked up a Garmin eTrex 20 for an upcoming brevet. This would solve another problem with the smartphones – my iPhone was good for a max recorded time of about 4 hours when the GPS app was active, even with the display turned off. The Garmin should last 20+ hours, and used AA batteries that I could bring along for spares. Unfortunately, things didn’t work out too well – I did the ride, but on a commute home a week later, the unit popped off the mount on my handlebars and was gone forever. After this short-lived experiment, I went back to the phone again. Besides the mount problem, the Garmin software was prehistoric. It was clunky, confusing, and getting the data on the computer was much harder than it should be. OK – I expect wireless in everything these days, people!! One of the downsides, however, was the subscription based “elite” membership you need to see a lot of the reports. The other thing I didn’t like about it was the simple cycling screen that wasn’t adjustable. It only showed a select group of data points, and this was not negotiable. That said, I used it for all of 2012, and it was rock solid reliable, and simple to use. 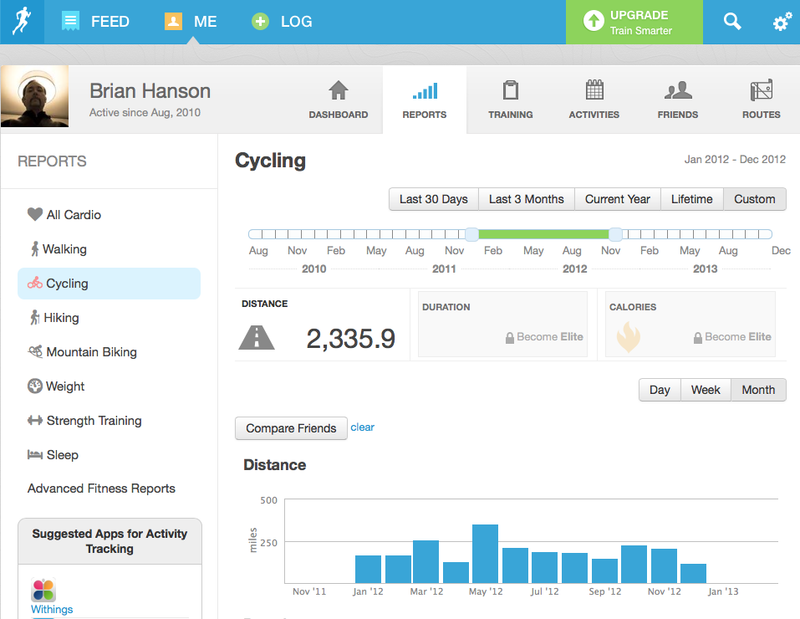 I liked the display versatility better than RunKeeper, and tied it into dailymile.com for viewing on the web. 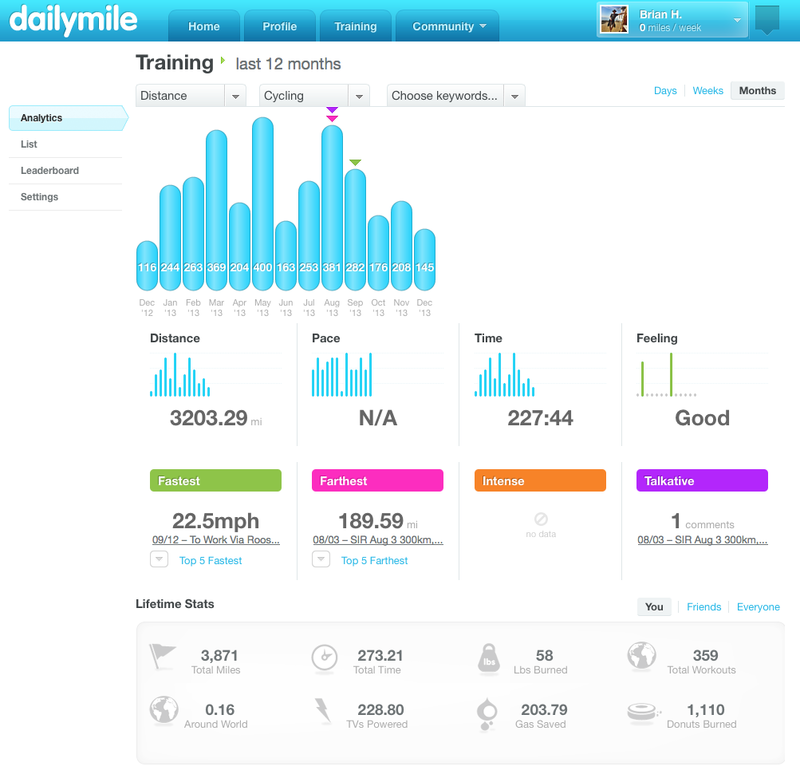 This site is a social media site that focuses mainly on the community aspect of workouts, so it doesn’t do a lot of advanced analytics, but if you just want a place to log your mileage, it works. This is a view I built in Excel from a data dump directly from Cyclemeter. Much more versatile, but a bit more work. This leads me to the problem of having a speedometer on the bike. 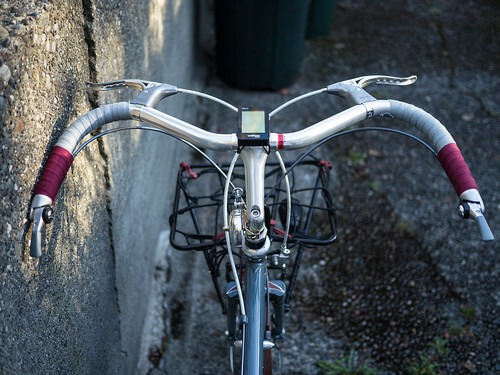 I tried a handlebar mounted iPhone case for a while, but found it a bit too bulky and over the top. I never lost it, or got it wet, but it wasn’t exactly svelte. The other problem was battery. I couldn’t really use it as a display for anything longer than an hour or two without draining the battery. The combination of LCD and GPS puts too much hurt on battery life. I wanted to do longer rides with the Seattle Randonneurs, and a 200k takes me about 9-10 hrs. I could get by barely by using my dyno hub to charge the phone during the day, but for any ride that goes into the night, I would lose that capability. All the power coming from the dyno would need to be used for my front and rear lighting. 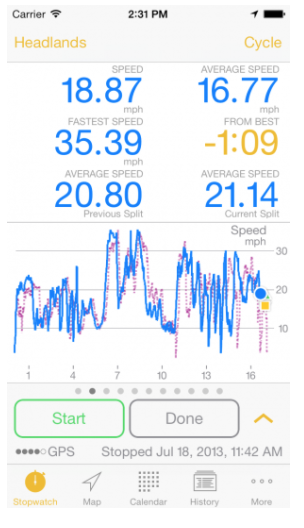 I became convinced that the newer Garmin Edge GPS units for cycling would be better. I picked up an Edge 810 and within a month brought it back to REI. Garmin still hadn’t fixed the confusing software, and to top it off, the hardware routinely shut off in the middle of a ride. The whole point of this device is to be on and track a ride from start to finish. I tried a few firmware updates, but it never worked the way I wanted it to, so I returned it. Back to the phone. I had a 300k coming up in August of 2013, so I knew I needed to be able to keep my phone alive for up to 20 hours. After doing some research and chatting with a co-worker who had just been to China. I purchased a RAV Power external battery pack. I brought this on the ride, and recharged the phone 3 times during my 16 hour ride. When I returned, it still had half its charge. It didn’t weigh much either. OK, I found the power solution, now I needed a display. Wahoo Fitness had the answer with the RFLKT bike computer. It is essentially a small bike computer that displays info from your phone application via Bluetooth. It is customizable, and allows you to see things like speed, time, distance, heart-rate, battery remaining, music playing, etc… It also lets you control the application with the 4 buttons on the device, and they can be programmed to do things like start/stop the app, control your music, scroll through multiple pages (handy if you want a main data page, and other pages for maximums, heart rate data, etc…) This thing is awesome, and has been rock solid. It integrates nicely with CycleMeter, is small and lightweight, has a lighted screen for visibility at night, and works every time I get on the bike, 3-5 days a week. This is going to be my solution for a while. 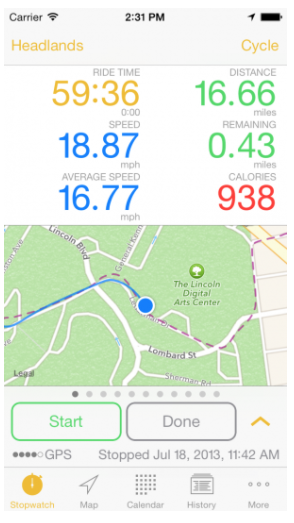 I believe that Garmin is in a losing battle with smartphone app developers at this point. Especially with the new M7 coprocessor that the newest iPhone has. Smartphone GPS apps are the future, at least until smart watches become the norm, or Google Glass. These apps are far superior, and quicker to update/innovate.